Yet, the Honorable Members of this house are aware they have been kept in the dark on such matters in the past. We have raised questions and received no answers. We have exposed irregularities on the floor of this house. The only response we received was ridicule and insults. My silence should not be misconstrued. It was by no means a cowardly attempt to be deaf, dumb or blind to issues. Nor was it in the belief that remaining quiet would allow such issues to be forgotten. To the contrary, it was only because I felt my first statement with regard to the so-called controversy over Treasury Bonds should be made to this House. Let me begin with the background of events. The Ministry of Highways of the Mahinda Rajapaksa administration made commitments and signed contracts totaling over Rs 100 Billion, without any monetary allocation. Funds were needed urgently to meet these payments. During a meeting on February 26 attended by Minister of Finance, Minister of Highways, Secretary, Ministry of Finance, the Governor Central Bank and the Deputy Governor, it was decided that Rs. 15 Billion would be required urgently. It was decided to raise a part of these monies through an auction of Treasury Bonds. By then, the Central Bank had already advertised the issue of Rs. 1 Billion Treasury Bonds. I insisted on a public auction because private placements have led to corruption and lack of transparency. Previously, parcels of Government bonds were handed out to selected individuals on a favored basis through a system of private placement. It took place outside the normal auctions of Government bonds. Private placements were usually as large as ten times bigger than the amount of Government bonds sold through the auctions. This led to an unhealthy link between some of the officers of the Central Bank’s Public Debt Department, Primary Dealers and large Corporations who benefited from such private placements. This practice only enriched a handful of cronies of the previous Government. Records confirm that private placements had become a norm rather than an exception. In just one instance in 2013, Rs 16 billion worth of 5 year bonds were sold through auction at a yield of 10.9% and thereafter Rs 76 billion of the same bond were sold through private placements at a HIGHER yield of 11.42%. Who stood to benefit from such acts? The answer is obvious. As a result of such anti-competitive practices the primary dealers had lost sight of their principal role in making for a transparent, liquid and competitive bond market. They were asking the Central Bank to dictate to them at what interest rate they should bid at the bond auctions. Such a practice has never been a norm and is unheard of in transparent auctions anywhere in the world. At this particular auction, where ill informed and intentioned criticism has been leveled, there were 36 bids from various Primary Dealers amounting to just over Rs. 20 Billion. When the Governor of the Central Bank was informed that over Rs.20 Billion bids have been received, he instructed the Public Debt Tender Board to select bids up to Rs.10 Billion. He did so in the presence of two Deputy Governors. The claim that the Governor interfered with the work of the Tender Board is not true. Thereafter the Tender Board submitted their recommendations, which were approved by the Governor without any changes. These monies that were raised were paid to the Treasury to fund the Divisional level Development Projects that was the subject of discussion in the House recently. Subsequent to this bond issue allegation of insider trading were made. The name of the Governor was mentioned in these allegations and aspersions cast. CHANDIMAL MENDIS – Attorney-at-Law with 18 years of experience in the bar. He assisted the then Finance Minister K N Choksy regarding the Parliamentary Consultative Meetings. Each of them has many years of practice and their credibility can be checked with the Sri Lanka Bar Association. I have selected lawyers who will not compromise their principles and not be got at. They also are respected in the community. The Committee has already met and started the investigation process. It is a matter of deep regret that they have become the targets of vituperative criticism. That vested interests are at work in this vain exercise to discredit the Government is all too clear. An issue has been raised that they are UNP lawyers. Many lawyers started supporting the UNP last year. One of those who made allegations that these lawyers are UNP is Shiral Lakthilaka. That a person who holds a responsible position has chosen it fit to engage in a campaign of vilification against the Government casts serious doubts over the motives behind their sinister campaign. Not surprisingly, the same Mr. Lakthilaka spent time in remand prison not so long ago for damaging public property worth five million rupees. He was expelled from the UNP. A partner in this campaign is Susil Kindelpitiya who was remanded on a complaint by a lady that he brandished a revolver at her. She later rescinded that complaint. It is such persons whose bona fides are in question who are casting aspersions on the members of the Committee. The investigations that are being carried out are not limited to this issue. It goes back to all transactions of public auctions and private placements from 2012 onwards. This committee has the option to call upon and consult other experts as they see fit. I expect startling revelations to surface because of the unhealthy practices that prevailed. Since Monday last week, Arjuna Mahendran has been on leave and he informed me that he would keep away from work until the investigations are completed. He is making way for a fair and independent inquiry into the matter. This is in stark contrast to the practices adopted by those who held the same position before. If however the Central Bank Governor is required to sign documents, I will consult the Attorney General before deciding on the matter. This is the first time in many years that the Government has responded to an allegation, started an inquiry and made a statement in Parliament. For almost a decade the allegations of malpractices in financial market has been stalled through surreptitious means. Instead of being praised for what we did, we are being attacked. There are a number of allegations of violations of the Colombo Stock Exchange market rules and Securities and Exchange Commission regulations. The minor ones were compounded. 13 large cases were abandoned purportedly on the lack of evidence. They were not investigated or were settled when it should have been probed further. I would like this to be recorded in the Hansard. I have requested the Securities and Exchange Commission to go into these cases. If necessary, I will bring legislation to permit such inquiry. I am also seeking for the appointment of a Parliamentary Select Committee to inquire into these transactions. Since some of the issues raised are under consideration by the Committee, I prefer to give an answer elaborate after the report is submitted. We plan to table this report in Parliament. We have created a free and fair climate for the business community. They are free from fear and intimidation. This applies to the media in this country too. There are no threats, intimidation or trips in white vans. It is high time they turn the searchlight into areas that have remained a virtual “no go zone” in the past. Take for example the banking sector. Take the name of Nimal Perera at Pan Asia or Ranee Jayamaha of Hatton National Bank. Who are they and how did they benefit from certain political personalities of the previous administration? How can Mr. Perera head a Bank given the large number of surveillance referrals made to the Colombo Stock Exchange? The National Savings Bank purchased 13 per cent of The Finance Company at fifty rupees per share. That is twenty rupees above market value. The mastermind behind this was Ajith Devasurendera and Dinal Wijemanne. Today, The Finance Company has recorded accumulated net loses of Rs 16 billion. Former Chief Justice Shirani Bandaranayake’s private Bank records were forcibly released by the then Management of the National Development Bank (NDB) against all norms relating to confidentiality of client data. It is for those in the banking industry to turn the searchlight inwards. They are not casinos or gambling dens. There are time tested traditions and conventions. Similarly, in the business sector a closer examination of some of the players becomes inevitable. Take for example Dilith Jayaweera. His roles in the Colombo Land and Development Company and the Reef Comber have to be probed by the authorities. Another such instance is Scott Newman and Kosala Heengama. Similar their role in Environment Resources Investments require very close scrutiny. Take the case of John Keells – the Government’s decision to cancel the casino licenses has resulted in shareholders dumping their shares. This is the only way to show their protest against questionable choices by the management. The airline has received a total of 375 Million US Dollars. Out of this, 50 million Dollars was spent for re-fleeting and the balance was utilized to cover the losses. As a result, Sri Lankan Airlines does not own a single aircraft. Thus, very clearly, the decision by the Cabinet of Ministers was not followed. Nor were matters reported back to them. These monies were not utilized for the items referred to above. We do not even own a single aircraft. The airline requires 125 million US Dollars to settle Ceylon Petroleum Corporation dues as well as its loan from the Bank of Ceylon. Some Members of Parliament went to the Commission of Bribery and Corruption and handed over their complaint against Arjuna Mahendran. I would like to ask whether you would like to do the same with Sri Lankan Airlines? How much was spent for the country’s development and how much went to fatten the purses of those corrupt is slowly but surely unfolding. Sooner than later, the people of this country will realize how their monies have been squandered. This sorry state of affairs came about against much touted claims of prosperity. The Central Bank had made losses for the past three years though self-acclaimed financial wizards, through devious campaigns, spoke of growth and gains. Millions of dollars were spent, without express approval by the Cabinet Ministers, on a string of public relations companies in an extravaganza of promoting Sri Lanka. Even chauffeurs of these companies received fat payments. This was whilst the Sri Lanka diplomatic missions were packed with political favorite’s and relatives of former Government leaders. The missions were only promoting those who were serving there. Enormous amounts of money were lost. There were credible allegations that the Central Bank was manipulating, or to say it more clearly, cooking up economic data. That such acts did harm to the country’s economy is one thing. Even worse, they plundered the taxpayer’s money for their own gains. I want to assure this house that we will leave no stone unturned in bringing the culprits to book. As a result of past misdeeds, the Central Bank has now been forced to embark on the task of re-building their credibility and standing as the country’s most credible financial institution. This is no easy task, since the spin masters have turned the institution into a wasteland. They left behind a legacy of mismanagement and misrule. They have been adopting a system of private placements of bonds. The criteria they adopted allowed the Central Bank to cut deals with Primary Dealers. Rebuilding international confidence and credibility has become an uphill task. Who are the people who are responsible for this mess? We have may be a half a Trillion to a Trillion Rupees worth of commitments made on highway projects. The media says that the Private Sector has lost confidence in the Government. The people have lost faith in the private sector, so have I. It is about time for the Private Sector to decide whether they can work in a modern transparent system or depart. I would be calling you up soon. The Associate Editor of Daily Mirror called on Arjuna Mahendran to resign. I have a problem with this. Long ago, Kesara Abeywardena ran an article asking me to resign as the Leader of the UNP – I did not take his advice. Kesara Abeywardena is a friend of Shiral Lakthilaka and he is a lackey of the Rajapaksa regime who is guilty of covering up blatant attacks on media freedom. That such persons of questionable integrity are preaching morals to us is not only reprehensible but also abhorrent. His colleagues are calling on him to “go in the name of god – go.” If he resigns, Arjuna Mahendran may resign. Hasn’t the media been irresponsible? The Sunday Leader owner Asanga Seneviratne runs a business that has made losses from the inception. How is it that he has so much money to pour in the business of creating public opinion? From where are the funds? These are all those who benefited from the Rajapaksa’s. I am sure members of this house are aware that one electronic media outlet has made me a target. Hardly a day passes without a campaign of misinformation and character assassination. All because I am not prepared to dance to the tune of the owner and meet all his demands. I must confess that I am emboldened by what they are doing. It has given me courage and strengthens my resolve to expose their sinister motives. There is also an ugly side to it. Innocent people are being misled but such numbers are dwindling. Their performance have ruined their credibility and lost them the trust of the public. One reason for this is that Indian Companies are looking at Palk Strait and exploring for natural gas. There is a company with strong links to the media that was trying to partner with one of these Indian Oil exploration companies. However the only credible partner for the Indians in Sri Lanka is the Ceylon Petroleum Corporation. I will not allow collaboration with any other Sri Lankan Company. I am determined to clean up the Private Sector, the banks and the Stock Exchange. This is the age of the people –“Mahajanaya.” I will listen to the “mahajanathawa” not to the “Maharajahs.” Anyone who has watched Citizen Kane will see how press baron William Randolph Hearst suffered as a result of his self-delusion. If you haven’t watched this, I recommend you do. I also want to state that there is an imperative need in Sri Lanka for an Independent Broadcasting Authority. This is like the one existent in the United Kingdom to ensure ethical and fair conduct. Some institutions at present have become tools in the hands of their owners who have to protect not only their business empires but also more importantly their secrets and sinister ambitions. It is only after we assumed office that the Central Bank adopted a more prudent system of calling for competitive bids. As a result the Government is able to raise funds at the most competitive rates. This would ensure that the government is able to raise money at the most competitive rates. The way the bond markets behave and how the secondary market works can be complicated and not many would understand the complex nature of transactions. But we can compare the latest 30-year bond issued under this government and the ones that were issued under the previous one. The 30-year bond of June 2014 was issued at an average interest rate of 11.75 percent. The latest bond was sold at 11.73, slightly lower than the rate paid last year. This means we were able to raise just over 10 billion rupees at a rate cheaper than what the previous government paid. Furthermore, there are several previous instances of the Central Bank accepting much higher volumes of bids than what were advertised. On 14 February 2014, Rs 1 billion worth of treasury Bills were offered and over Rs 11 billion were eventually sold. On 14 November of the same year Rs 2 billion were offered and over Rs 13.5 billion were sold. What our government and the Central Bank have done is to raise money for the Government at the best possible rate through a competitive bidding process instead of using private placements. The House would agree that it is not a healthy practice to allow private placements when we could get better terms by opening up to a competitive environment. By resorting to a traditional transparent auction of government bonds, the Central Bank has already made significant progress in raising funds for the Government. Just last week a record Rs 100 billion was raised in 4 auctions to repay Rs 79 billion of bonds coming due this week and to keep funding government projects. The most important aspect of the entire issue is the transparent manner in which we responded to the criticism directed at us from various quarters. We never stifled any voice of criticism. The media, the civil society, political parties were given total freedom to voice their opinion on the bond issue. There were no white-vans at the doorsteps of those who criticized the government on this matter. Secret units did not tap their telephones. No one received threatening phone calls after voicing their opinion on the bond issue at public forums – like they did in the past, under the watch of the Rajapaksa regime. The People, the legislature, the civil society and the media were either hoodwinked or intimated when it came to problems involving public money. That is the main difference of the present government. It acts in a responsible manner and is accountable to the public as well as to the Parliament. When I raised a question about the Colombo Port City issue in Parliament, the previous government said “documents” of the deal should be brought to Parliament in Lorries. That was the manner in which they responded to allegations leveled by the opposition. Two Director Generals of the Securities and Exchanges Commission were forced to resign when they tried to investigate allegations of corruption. Journalists were not even allowed to write about the circumstances under which the Director Generals of the SEC had to leave their positions. We have acted in a totally different manner, demonstrating that we are a government that is accountable to Parliament. People wanted an end to that dark decade and we have shown the “change” we have brought about over the past two months. What we have at the moment is not a “bond issue”, but an issue of certain elements who have been rejected by the people. Earlier, they attempted to defeat President Maithripala Sirisena at the presidential election, and now they and their sycophants are attempting to sling mud at us for their petty political gains. They are, I must say, trying to take undue advantage from the democratic platforms that we have created under the new government which came to power after January 08 elections. එදා ජනාධිපති මෛත්‍රිපාල සිරිසේන මැතිතුමා පැරදුණා නම් අඩිහයක්පොළොව යටට යවන්න බලා සිටි අය අද යහපාලනය ගැන අපටඋගන්වන්නඑනවා. අපි ඒ අයගේඅරමුණු ගැනහොඳට දන්නවා. ඔවුන් මේ මඩ ගහන්නේ පරාජයේ වියරුව නිසයි. ඔවුන් ප්‍රශ්නගැන ක්‍රියා කරපු අන්දමට වඩා සහමුලින්ම වෙනස් අන්දමට අපිප්‍රශ්න ගැනක්‍රියා කොට තිබෙන බව අපි පැහැදිලිව ඔප්පු කොටතිබෙනවා. තැන් තැන්වලහැංගී මඩ ගහන්නේ නැතිව මහ මැතිවරණයකටපැමිණ අප සමග මුහුණටමුහුණ සටනකට එන ලෙස මම ඔවුන්ට අභියෝගකරනවා. This government has nothing to hide as we have always been guided by the principles of good-governance, which was at the core of our election manifesto. I must also reiterate that the government’s efforts cannot be hampered by malicious and vituperative propaganda campaigns. I must tell this House that there is something happening in Sri Lanka at the grassroots level. Change is happening. Instead of poverty, corruption and injustice people see hope of prosperity, good governance and justice. For, a decade they have faced the darkest of demons and impossible odds and as one people they have spoken in January for a better way. I now speak in this House on their behalf. They stand with us now for good governance. They stand for Justice and Fairness and they stand for Prosperity and Jobs. They stand with us for Freedom. They believe in this journey that we have started together. And we will not let them down. We will finish this job. Reading all comments for and against and the circumstances that have led to the event is indeed an intrigue. I find it difficult to believe that Ranil Wickremasinghe would have appointed Arjun Mahendran to the post of Governor Central Bank if he was a shady character, to begin with. Besides to believe that this would have gone unnoticed, is also difficult to believe. Then what is the rationale for this gross blunder to have been committed, knowing fully well of the consequences as has resulted. Is it something that have been preplanned knowing fully well it will land at Ranil’s feet to discredit him? Ranil would have never allowed something like this to happen under his governance if he had prior knowledge. It is said that AM had no hand in increasing the interest rate from 9% to 11%. 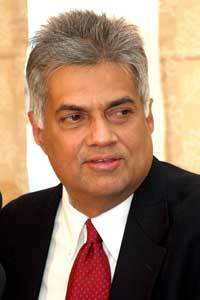 What is intriguing is, was Ranil aware that AM’s s-i-l Alosyous was a bidder for the Bonds? Was it prior knowledge that Alosyous had indulged in this type of deal with Nevard Cabral and Namal Rajapakse previously? Did Nevard Cabral have a hand in this through his cronies at the Central Bank to set this up? Did Alosyous trap Arjun Mahendran for a bigger payment from Nevard Cabral and MR crowd, to ridicule Ranil Wickremasinghe? These are issues to ponder for the Committee investigating the matter. Excellent speech / explanation Hon. Prime Minister…you expalined well and disclosed about the private placements and over subsbribed bond issues…Well done…BUT that does not you should do the same mistake either knowingly or you being taken for granted by those whom you trusted. This latest bond issue was also listed for 1b but ended with an additional 10B….Lets avoid doing the same mistakes by the predecessors. You have raised few valid questions. However its up to Ranil to ensure a transparent and credible investigation. Whether the investigators have sufficient knowledge and skills of trading bonds is another issue. Compared to Lawyers, some of the characters involved with the Stock Market and the Bond Market are smart Alecs sans Professional qualifications. Some like the Godaperakadoruwas mostly Lawyers clerks with years of experience are smarter than some of the qualified Lawyers. Similarly some averagely qualified Financial Market players are born crooks who know to hoodwink Professionals including Chartered Accountants. Give the Devil their due, such is their fete and abilty. Excellent speech. I was intrigued by the accusers but had my doubts about this whole affair. One thing about the investigators appointed. They have to be law professionals. Inevitably the PM will appoint those whom he is aquainted with. That does not mean anything sinister. You do not expect PM Wickremasinhe to appoint a member to this committee from lawyers who washed Rajapakshe’s dirty linen now would you? Also this claim that those who are appointed need experience in the securities trading business. If you read PM Wickremesinghe’s speech you will get the impression that almost all those engaged in this business in Sri Lanka have been engaged in some kind of shady transactions and have no credibility in being able to investigate them selves. You need an outsider with a good reputation to do the job. The level to which this has been blown up suggests to me that it is all trumped up without any merit whatsoever. But what will happen because of the stupidity of these crooked morons who dreamt up this plot is that a lot of wrong doing in the private sector in collusion with the CB under MRs watch will be exposed. That is why there is such a din been made by those who know they are about to be kicked up their backsides. Thanks. I was wondering when somebody takes this up. Singapore constitution doesn’t allow dual citizenship and thus the only way for Arjuna Mahendran to become a citizen of Sri Lanka is to renounce his Singaporean citizenship first. Has he done this or committed an offence against the law of Sri Lanka and Singapore ? Does he have the necessary working visa if he is a foreigner? My understanding is that a residency visa granted for ex Lankans or spouses of Sri Lankans doesn’t allow working. What might be the citizenship status of the son of Arjuna Mahendran? Does he have illegal dual citizenship in Sri Lanka and Singapore? Note that there are many business activities that foreigners are excluded from in Sri Lanka. Are the Mahendrans operating bank and brokerage accounts in Singapore? I have nothing against Arjuna and his son but demand good governance and rule of law as promised. You ve got your knickers in a twist. Nobody is discussing Arjuna Mahendran’s son. Does he even have a son? The issue is that his son in law Arjun Aloysious , who has a Bond Trader License issued by the CB in Cabraals tenure, as do all the other bond traders do. But the other Bond Traders during the Cabaal years got Private Placements. They are the business MAFIA, that brought this issue into the media, hoping to scare off Aloysius. So that s where the rot has set in. Now, they are trying to fix AM, The Govenor, a very experienced respectable man & his son in law, Arjun Aloysius , just to get at the PM. There could be no better man to head the CB, than the scrupulously clean Mr Mahendran, who has worked with a number of the TOP banks worldwide. RW was, very wise in having to managed to secure his services for the job, tho there were other contentdors, the like of the acid faced Dinesh Weerakoddy, get on Google see his profile, pathetic, only good for a banana republic , not for a nation try to raise its head, with everything we’ve been through. AM couldn’t have got to the level he is if he had dirty fingers! What is the issue, that you Sri Lankan people bring up about him being a foreign national? All we want is the expertise to get out Country on the Road Map, & I am sure that Mahendran will do this for us & give our Country the credibility it does deserve. Dr Ernest Corea was Ambassador in the US representing SL on an American passport. Why do people import labor at high prices? To get the job done by people, who have a knack of how things work in the financial markets, that most people would be ignoramus to . Most of the previous government held foreign passports, no one cared or we were too scared to mention it. Support Governor Mahendran, give him time, he s hew to this snake pit & I CAN assure you & the rest of the doubltfulSri Lankans, that we need people, who are educated as well as experienced to take on a role of this stature. Thanks and good to know that somebody is reading. I understood myself also my mistake about writing that the son in law is the son of Mahendran. Sorry about it. He is a professional and experienced but I have doubts about any private banker of TOP banks being “clean”. These are the people who help others with money laundering etc. I don’t care about Mahendran being a foreigner or a Tamil. Some others have problems with these facts. Some even might consider Mahendran a “traitor” of Tamils. What I want to know is he now a Sri Lankan citizen and has renounced his Singaporean citizenship. He cannot be a dual citizen according to Singapore constitution. I also would like to know what kind of SL visa(s) he has in case he is a foreigner. USA allows dual citizenship Singapore doesn’t. My main point is: how can the new president and government who were elected promising rule of law and good governance allow this? If Mahandran has renounced his SG citizenship and is now a citizen of SL there is no legal problem with that. Of course the bond deal is another issue that I won’t comment now. I am suprice at this speech. James Bond? Does any PM talk like this??. To cover and deviate the attention so many names dropped. Sad to see this kind of behavior by a leading politicos. According to him 98% of leading business personal are crooks.Have anyone been convicted? Any politicos have clean sheets that can be considered to judge others and point figures. Is there proof of any wrong doing by anyone of them. If you don’t understand financial transactions then may be you should have advises that clearly provide better understanding. I see no develop country do so much witch hunt for just being businessmen. This give bad credence to country that needs more bussiness to come back investment and provide opportunity. Some people whom have been harrased by the previous government are also mentioned. Do they have clear understanding of better governance, equal opportunity, right to information. Or governments discuss gossip. Grow up !!!. We all lover Sri Lanka.